Last week’s Ladybug Blog extolled the historical, cultural, and culinary delights of pumpkin. It seems as though you can’t step foot into a grocery store, candle shop, or cafe without being inundated with products that revolve around pumpkin spice. As ubiquitous as the combination of cinnamon, clove, and allspice have been the past few years I remember a time when the flavor of early fall was apple; from cider and cider doughnuts to pies and apple butter. Many a school field trip or family outing revolved around a trip to an orchard to pick one of the many varieties of apples available in New England and return home laden with bags of this versatile fruit. The pleasure of these adventures was increased if the destination also had a working cider press. That sweet/sour smell of the overripe apples being pressed says fall much in the same way that a freshly-cut fir tree hints that Christmas is on its way. Apple orchards have been a part of Connecticut and New England since cultivated apples (Malus pumila also known as M. domestica) were brought here by the European settlers in the 17th century. The first recorded apple orchard was planted in 1625 by the Reverend William Blaxton in what is now Cumberland, Rhode Island. Reverend Buxton cultivated the Yellow Sweeting apple which later became known as the Rhode Island Greening, a cooking apple that has a greenish-yellow flesh. Before that only the small, sour, wild apples which we know as crabapples grew in North America. Crabapples are used as ornamental trees in landscapes and as they are heavy bloomers are great sources of pollen for cross-pollination in apple orchards, are a good source of pectin, and as a rootstock that provides cold-hardiness to domestic apples. The use of crabapple or other apple varieties as a rootstock in grafting is very important in modern orchard farming. Apple trees grown from seed do not grow true to their parent plant and can be anywhere from 12 to 36’ tall, features that are not conducive to consistent apple production and ease of harvest. Therefore, grafting, the technique that combines the beneficial traits of 2 or 3 apple varieties is greatly beneficial. In the simplest of terms, grafting is the procedure by which a scion (a piece of last year’s growth that has 2-3 buds) is cut from an existing tree of the desired apple variety. The scion is inserted into the cambium (vascular) layer of the understock (rootstock) of another apple variety that may bring traits such as disease resistance, crotch strength, adaptability to heavier soil, a slow growth rate, adaptability to espalier training, or the above-mentioned cold-hardiness. The new graft is generally bound with tape and a grafting compound. Detailed information on grafting can be found in books or online. Cider apples are usually a combination of cultivars that are grown specifically for use in cider production to have higher sugar and tannin levels and are often more astringent than the eating and baking varieties. These qualities contribute to a final product that has a deeper flavor. Among cider apple varieties are some that are higher in sugar which causes their cider product to ferment resulting in hard cider. In fact, hard cider was an important beverage at a time when refrigeration was unavailable. Most apple cider produced today is pasteurized, a process that heats the unfiltered apple juice to prevent bacterial contamination. It also destroys any yeast that would cause the juice to ferment creating a more stable non-alcoholic product. In fact, ‘Johnny Appleseed’, the folklore hero born as John Chapman in 1774, planted seeds that produced apples that were only good for hard cider (or applejack), not for eating. In 1993 The Enfield Historical Society brought a manual cider press to the Old Town Hall Museum. Since we were members of the Society my husband Russ and some friends were enlisted to turn the press. Layers of burlap-wrapped apples are squeezed in the manual cider press. It was a beautiful, sunny fall day, perfect for an outdoor exhibition. Our children and friends were among the crowd that gathered to watch the action. The resultant cider was not distributed as it had not been pasteurized but there were jugs of pre-pressed cider for the enjoyment of all. Crates of apples await their turn in the press. Humans are not the only members of the animal kingdom that appreciate ripening apples. At this time of year, it is almost impossible to get near an apple tree without being in the presence of yellowjacket wasps as they forage for the sugars that are important to their developing queen in late summer. As overly ripe apples fall to the ground the yellowjackets will swarm the fallen fruit. A beautiful Mutsu apple showed the scars of an encounter with yet another species that wanted to feed on the delicious ripening fruit. Although this apple was about 5 feet above the ground an animal, possibly a raccoon, had attempted unsuccessfully to get it. Mutsu apple with animal damage. We, however, picked many Mutsu (also known as Crispin) apples, a very crunchy and sweet variety that is a cross between the Golden Delicious and the Indo cultivars that is great for eating and several pounds of Cortland destined for pies, crisps, and apple butter. Connecticut’s orchards are still going strong so visit the Connecticut Apples site to find one near you and enjoy some of the many delicious varieties that are grown in our state. Many of the calls and inquiries that we received at the Home & Garden Education Center this summer season revolved around the effects of the high temperatures and the lack of rain on vegetable gardens in the state. So many plants had stunted growth and little to no fruit production, especially tomatoes. Extremes in temperature and hydration will cause tomatoes to drop flowers before they are able to set fruit as the plant knows that it won’t be able to support the developing fruit. In my garden not only the tomatoes were slow to produce. 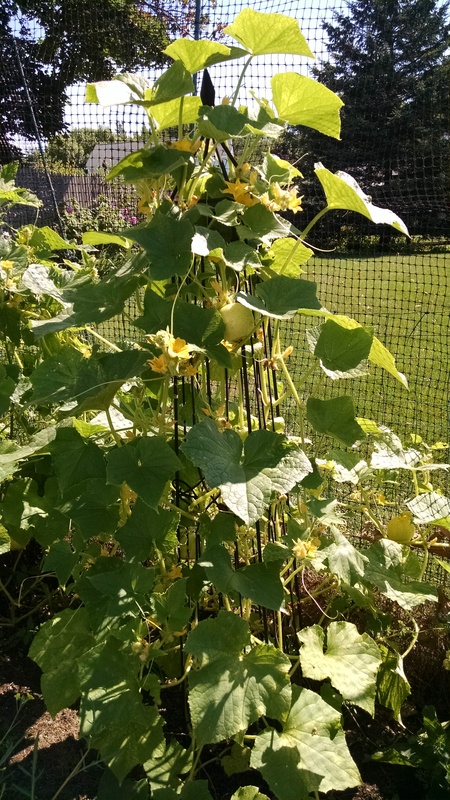 Squash, zucchini, and eggplant dialed back their production by mid-July and I actually pulled out and replanted all of the pole beans that had just withered in the conditions. Strangely, the carrots very well as did the arugula but not so much for the beets. I did not rely on nature for water but supplemented from the quickly emptying rain barrel. Once the temperatures moderated a bit in late August everything started to recover. I always plant several varieties of tomatoes, as do many gardeners, and this year, on the recommendation of my brother, I chose a variety called Fourth of July. Fourth of July, as its name suggests, is supposed to produce fruit by the 4th of July. It didn’t quite hit that mark although it was one of the first to achieve mature, slightly larger than a golf ball-sized tomatoes. This plant continued from that point prolifically giving lots of these great for salad tomatoes. I loved cutting them into 6ths and tossing them with cubed fresh mozzarella, large croutons, olive oil and some fresh basil. Letting this salad sit at room temperature for about 30 minutes allows the croutons to absorb some liquid and all of the flavors to come together. Yellow plum tomatoes also did pretty well but most of the other varieties were sporadic at best. Fortunately with 13 plants there were enough ripening at the same time that I could still combine them with squash and eggplant and can several batches of ratatouille. As the nighttime temperatures started to drop into the 50s I would cover each plant at night, remove the covers in the morning trying to extend the time that the fruit could remain on the plants. I actually kept this up into October and the squash, tomatoes, and eggplant survived some dips into the upper 30s. However, by October 25 my patience had dwindled and I decided it was time to call it a day for those plants. The only issue with this decision was the fact that due to the late development of the fruit so many plants still had an abundance of unripened tomatoes. In fact, the variety called Black Krim had copious numbers of large beautiful fruit of which not a single one had ripened! I filled two large colanders from this plant alone. I probably had 20 pounds of green tomatoes. What to do? I’ve heard of fried green tomatoes and have even made a green tomato chutney in the past but I knew that there must be more than that. 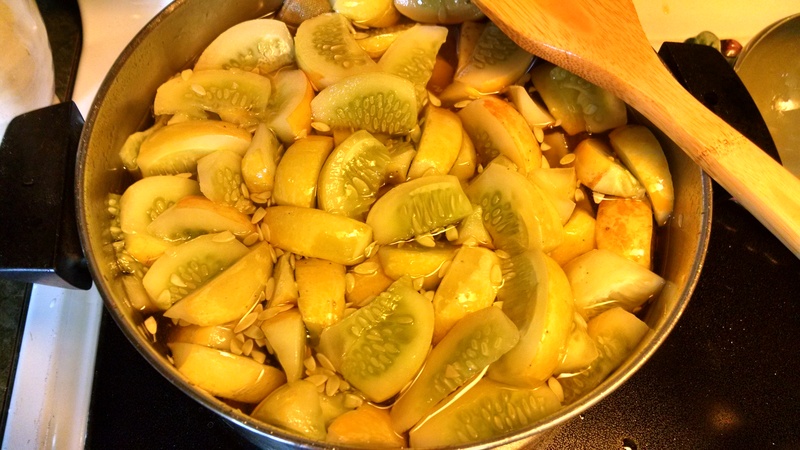 I roasted a batch with olive oil and salt and also cooked up a batch of salsa verde, combining the finely chopped green tomatoes with jalapenos and lime juice. I then canned them in a boiling water bath. I used the smaller green tomatoes for these recipes. The large Black Krim tomatoes presented an opportunity to ripen tomatoes off of the vine. I know that it is possible to even allow tomatoes to ripen in the cellar although I had never done it. First step then: Google it. As I searched for ways to ripen green tomatoes two methods seemed to keep appearing. First, the wrapping of each tomato individually in newspaper and placing them in a non-humid, slightly cool area (but not refrigerated). The second method was very similar except that the tomatoes are not wrapped in paper but left to just sit on paper toweling. Well, why not try both methods and see how it goes? It is important that there are no soft or rotten areas on the fruit. The tomatoes that were in the open flat seemed to ripen a bit faster but when equal sized fruit from each box is placed side by side the difference is negligible. There haven’t been any signs of rotting or softening. Some of the articles that I used for research stated that ‘you can eat fresh tomatoes in January’ by following these methods. I don’t think will probably happen based on the speed with which they have already ripened but to still be enjoying the taste of fresh tomatoes well into November is fine with me. It’s that time of year. The weather has been hot and the garden is producing vegetables faster than we can consume them. 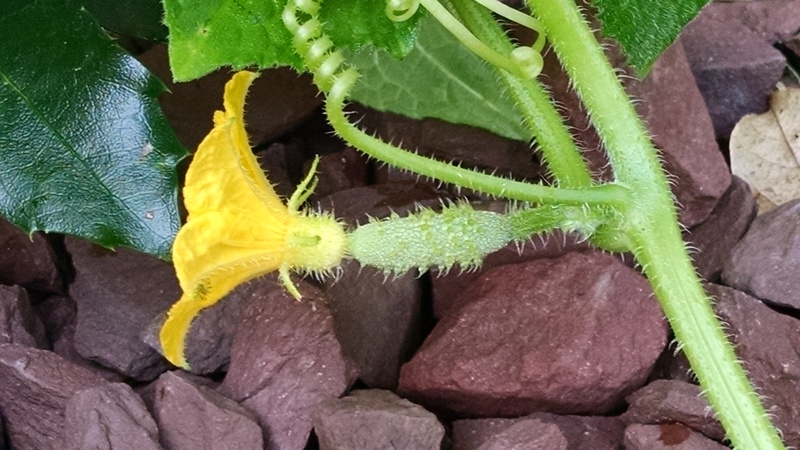 The squash, zucchini and cucumbers are coming in fast and furious. 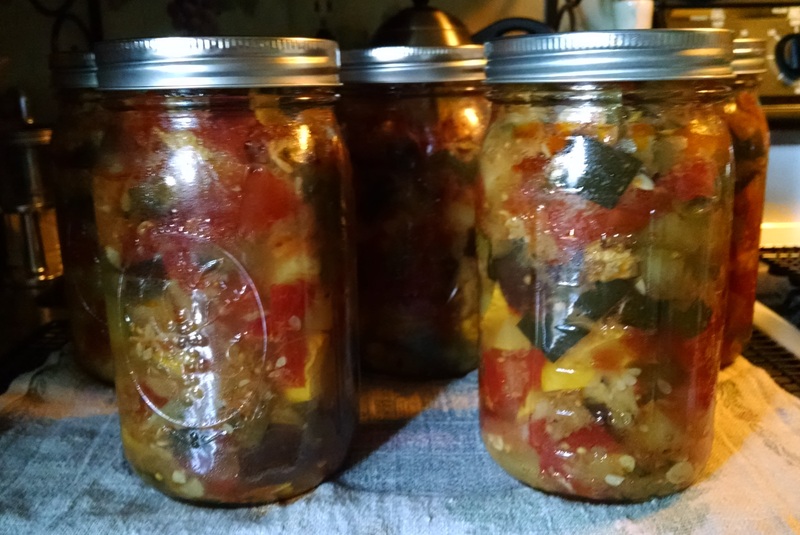 A batch of ratatouille has already been processed and this past weekend it was time to put up some pickles. 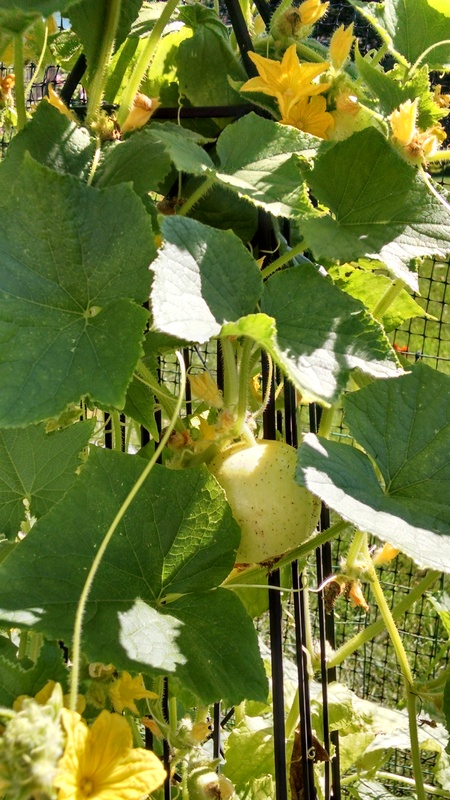 There are several varieties of cucumbers in our garden including the smaller pickling cukes, the long English cucumbers (it doesn’t seem proper to call them ‘cukes’), and a fun variety known as the lemon cucumber. 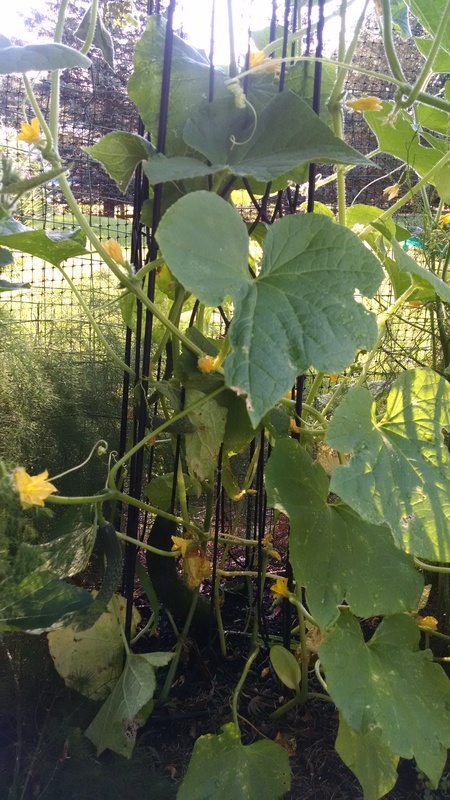 All of the cucumbers are grown on trellises which enables us to grown vining plants in a smaller space. By going up instead of out, air circulation around the plants is increased, the fruit can grow straighter, and it is easier to harvest. The lemon cucumber variety has been around since 1894 and a package of the seeds were offered in the 1901 James Vick & Sons catalog for 10¢. The description was as follows: “The flesh is exceedingly tender and crisp, with a sweet flavor surpassing all other cucumbers. They have none of the bitter or acid taste so generally found in cucumbers”. I confess that when I was first attracted to it a few years ago I planted it as more of a novelty than anything else. 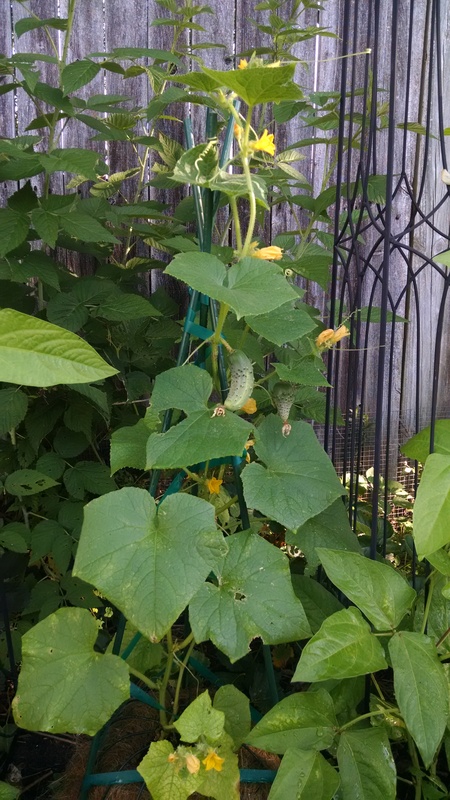 I was surprised to find that it is a vigorous plant that sends out yards of growth. 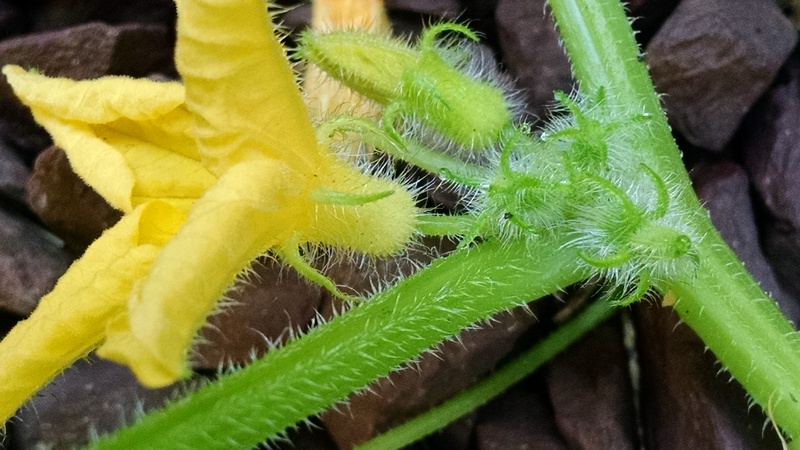 It is andromonoecious, with male and female elements in the same blossom, results in more natural self-pollination than that of monoecious cucumbers which have the sexes in separate flowers on the same plant or gynoecious which has only female flowers. Seed companies will generally include 10% of a monoecious variety to ensure pollination for gynoecious varieties. Why choose a gynoecious or andromonoecious variety? They will generally out-produce monoecious varieties since all of their flowers are capable of becoming fruit. How can you tell a male flower from a female flower? The female flower (the image on the left) will have an immature fruit at the base of the blossom while a male flower (the image on the right) will only have a petiole connecting it to the stem. 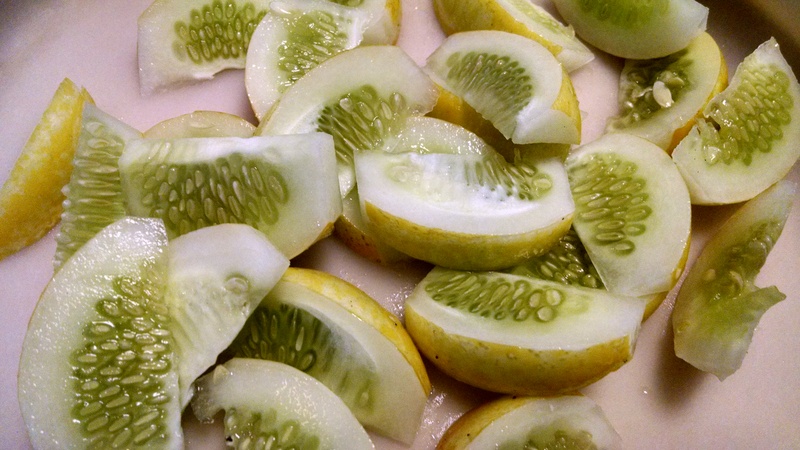 The fruit of the lemon cucumber is as its name suggests, the size, shape, and color of a large lemon and when cut is has the appearance of a lemon wedge. I enjoy pickling them as much for their taste as for the beautiful and unique way that they look in a jar. The following text and images are a quick overview of the boiling water canning bath process but full details can be found at the USDA Complete Guide to Home Canning. After the cucumbers have been washed and the ends trimmed I then cut them into wedges. 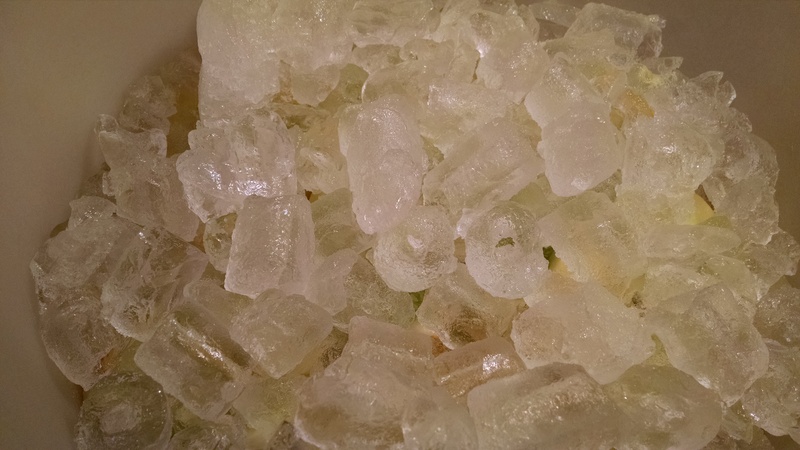 They are placed in a large bowl, sprinkled with coarse salt and covered with crushed ice. After 2-4 hours of refrigeration they are ready to be drained and rinsed. While the cukes are in their ice bath I prepare the pickling syrup of sugar, vinegar and pickling spices. I also add powdered turmeric to add flavor and a tint of yellow to the finished product. 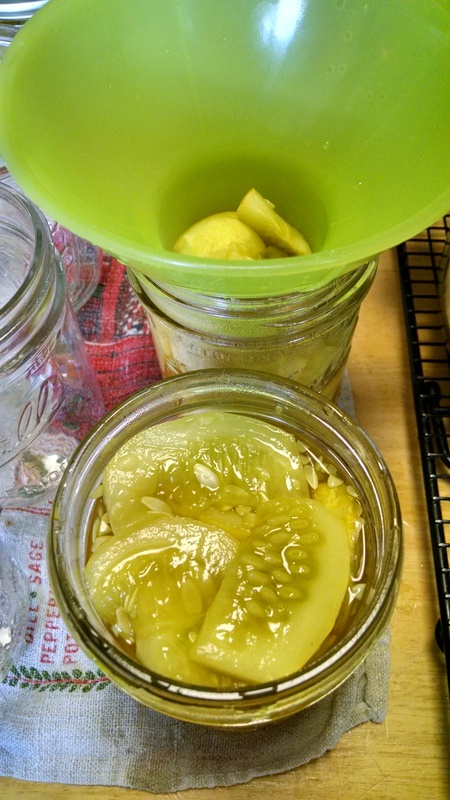 The hot cucumber wedges and the pickling syrup are ladled into sterilized glass canning jars, sealed and put into a hot water bath. 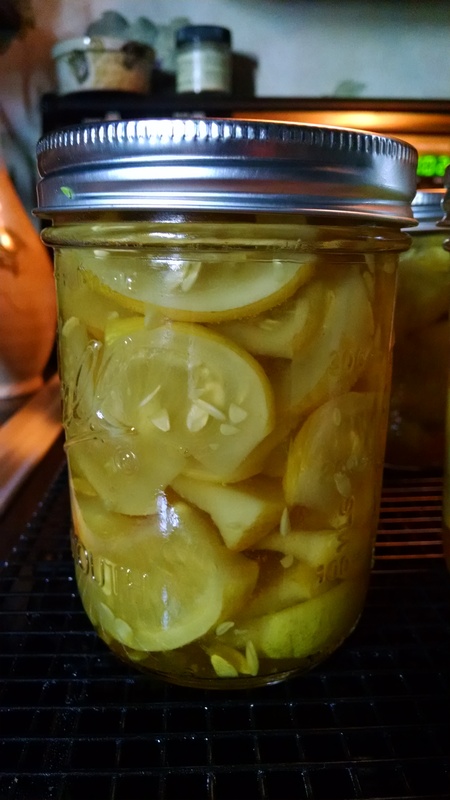 Due to the high acidic content of most pickled food they do not need to be pressure canned and can be processed by being submerged in boiling water for the USDA recommended amount of time. Once cooled, the jars can be stored in a clean, cool, dark, dry place ready to be enjoyed all winter long.